The reason that bowling swing is an art is that it takes street-smart tactical nous. You already know that good swing bowlers are about more that running in, trying to hit a length and hoping it swings. You know that you need to be quick thinking, bold, confident and aware of your own game. It doesn't always happen like that though. Sometimes you are confused, you change your mind halfway through your run up. You doubt your ability and you are unsure in certain tactical situations. Unlike a raw pace bowler, you can't rely on sheer pace to do the work for you. You have to understand yourself, your opponent with the bat and the match situation. Because when you can do that you can take bundles of wickets. With some simple adjustments you can easily be the self-assured tactically aware bowler you have always wanted to become. Nathan Bracken did it at the highest level, and now he wants to pass his advice onto you in his exclusive swing bowling tactical tips. It's the type of help that you simply can only get from a bowler who has bested some of great batsmen in International cricket. No wonder he took over 200 wickets for Australia and won an IPL contract. The secret is that Nathan has been through it all. He has learned the ways to use to become a reliable and effective swing bowler and he is passing his findings directly to you in the Swing Bowling Masterclass online coaching course. He practised long and hard, learned how to deal with pressure, bounce back from failure and bowl in just about every possible situation from Twenty20 to Test cricket. The online coaching course also contains worksheets and knowledge tests so you can not just watch the streaming videos, but also interact with them to monitor your improvements and test your new found skills. There is also an online forum only available to those inner-circle to discuss the art and science of becoming a great swing bowler. All you need to to to get instant access to all these resources, plus streaming video from the SCG, is click the green "buy" button. Please note: this is an online course where the content is all available instantly online. There is no physical product to be delivered so when you act you get instant unlimited access. Discover the most important tactics with the new ball in all formats. This interactive video guide talks you through the best lines and lengths to bowl in different circumstances when you have the new ball in your hand. The middle of any innings is often the least clear time to bowl. Learn your method here. 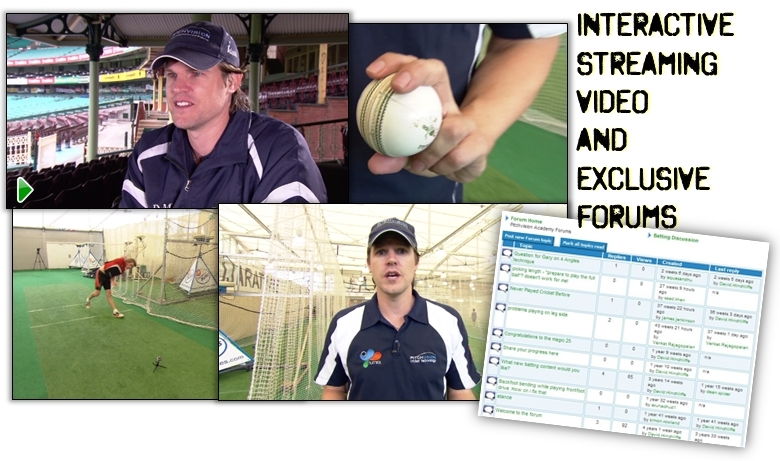 This interactive video guide and workbook will talk you through all your middle over tactic options to take wickets and restrict the run rate. Bowling at the death is a skill that can earn you great respect. Here is how you do it. Watch this interactive video guide to bowling at the death. The video covers variations, dealing with the pressure and what to do when a batter gets after you. Click the link to play the quiz. The entire course can be downloaded, printed and read in this 10 page eManual with full colour images. This is a pdf file. Chat swing bowling tactics on the forum.